Some revolutions leave more of a mark than others: the content revolution, the industrial revolution, and the revolution that saw Katniss take Panem in the epic finale of the Hunger Games. One of those things isn’t quite like the others, though revolution is the name of the game for 2016, as the content revolution continues to sweep across Ireland. The content revolution may have taken its sweet time taking hold of our little nation, but it has arrived with a bang as more and more Irish brands are dipping their toes in the water and implementing excellent content and inbound strategies. Today we’re taking a look at the content tactics that will rise in 2016. Just don’t be expecting a coup, as content’s reign isn’t likely to end anytime soon! We asked some of the most brilliant minds in Irish marketing for their thoughts on our content marketing survey, their predictions for content marketing in 2016, and how those two things worked together. Pull up a seat and have a read! It was heartening to read that 79% of those surveyed [in the State of Content Marketing] felt that having a content marketing strategy was important for their business. This is a dramatic shift we’ve seen in recent years. I anticipate that we will see a number of changes in content marketing plans in 2016 including an increase in micro video formats with organisations creating video for platforms such as Snapchat, Instagram and Facebook. Those brands that will win at content marketing will need to develop very close relationships with their agencies if they want to win the race of engaging real time marketing. In addition, in the next 12-24 months we will see organisations building in-house capability for content creation as the volume of content to drive social marketing plans means that budgets have to be managed carefully. I also anticipate that we will see increased focus on content marketing promotion – creating and publishing engaging content is the first part of the journey to engage your audience and increase leads, sales or even donations. It goes without saying: content marketing is extremely important and always has been. In the past, consumers tolerated traditional sales and generic marketing ploys, but we live in an era where the consumer is wiser and looking for more. They want bespoke content that’s specific and tailored to themselves. 2016 will see more and more businesses targeting their strategy to smaller, relevant audiences to generate leads and conversions. More businesses are creating content specifically for social media platforms. Soon, we will see Facebook and LinkedIn become direct publishing platforms for content. It’s interesting to me that only 26% of Irish marketers say they are successful with content marketing and 86% say they are not using a content management software to manage their content efforts. There is a clear correlation here between these two statistics. If you can’t measure what’s working and what’s not, you can’t optimise and improve. Think of it this way. Those who measure improve. Those who improve grow. If only 26% of Irish marketers are currently seeing success, there’s a huge opportunity here to be an early adopter and get miles ahead of your competition. If you’re going to invest in content marketing, you need to do it right. Persona development and inbound strategies will be even more vital to success. Develop your personas, put the right infrastructure in place – both strategy and technology – and commit to it. It’s a long-term strategy for business growth with proven success. content will help avoid falling in to the trap of producing content for content’s sake. At LinkedIn, all of our output is designed to either inspire, educate, or entertain. Sometimes it’s just one of those, sometimes it’s all three. At the top of the funnel – when the focus is driving awareness and driving leads – it might be a blend. You can be more focused on education, through case studies for example, towards the bottom of the funnel. It’s surprising that, in 2015, less than half (48%) of Irish marketers have a documented content marketing strategy. Hopefully this is one of the things we as an industry will see change in 2016. In 2016 we will finally see video start to dominate. Not only is the public’s appetite for video at an all-time high – and growing significantly – but the medium also works really well when it comes to re-purposing content, which can make your budget go further. With a great video, you also have audio, text, and stills from which you can create tons of other great pieces to use in different channels. It’s alarming that 46% of respondents have no buyer personas detailed and that so many respondents have no documented strategy. This effectively means businesses are spending hard earned revenue creating content for nobody. This is the age old “Shotgun Approach” and it’s crazy stuff. Overall I believe that Irish businesses need increased training and education on how to market online effectively. It seems to me that Irish businesses, especially SMEs on a tight budget recognise that they need to be active online but have adopted a “just get it out there” approach that ultimately doesn’t serve them well at all. In 2016, education will be more important than ever to create savvy marketers. It is great to have the current state of play of content marketing in Ireland and a report that helps us understand how the industry is shaping up relative to other markets. However, I’m not surprised by the key findings. Ireland is still playing catch-up in a lot of respects whether it is Digital or Social. So it is no surprise that only 26% of Irish marketers rate their content marketing efforts as successful. The results show that most don’t have the correct platforms in place to support and help amplify their endeavors nor have they a clear strategy. However, it is clear that there is a huge opportunity for Content Marketing to deliver a much higher/improved ROI but only when the companies themselves develop and understand their own strategies and how to derive value. More value placed on content marketing as ad-blocking technology matures and becomes more prevalent. Continued effectiveness of Targeting and Personalisation with specific emphasis on mobile. Companies to have all the answers to buyers questions at each stage of their journey, not just the start. Video content; short sharp targeted snippets will start to replace written content. 2016 will be the year of content streaming. Periscope, Blab, Instagram and even the old reliable YouTube will flourish with stories told in a different way to what we have come to expect. their content marketing as important or extremely important, only 26% rate their content marketing as successful or extremely successful with three quarters of Irish Marketers producing more content than last year. Reading between the lines, it’s interesting to note that while customer engagement, brand awareness and lead generation are the three most important outcomes sought, the most popular metrics, traffic, rankings, and dwell time all relate to only one of these outcomes – awareness. The survey highlights how brands are focused on brand awareness, but that content for the middle and bottom of the funnel is missing. In 2016, marketers will pay more attention to their various personas and create more content for people further down the funnel, which should lead to more qualified leads. Social media is ‘social’ and not about selling, and that’s something that more marketers are going to have to embrace in 2016. We’ve seen a switch over with more engaged and conversational brands on Twitter, but there’s still a very corporate sales feel to lots of brands. Above all else, the secret to marketing is to build relationships with others. You want people who genuinely care about you and your brand, and not just someone who liked the page once to win a prize. 26% of Irish marketers rate their content as successful which really shows that some marketers may have a lack of knowledge around certain platforms. Education is a big one for 2016, with more marketers moving to content marketing management and analytics software. Now Twitter counts are gone, further emphasis on measurement and using programs like Agora Pulse will be a big part of strategies for marketers next year. So there you have it. Ireland’s best and brightest have spoken. We hope you paid attention! What’s that survey they were talking about? Do you want unlock the truth and find out the state of content marketing in Ireland? 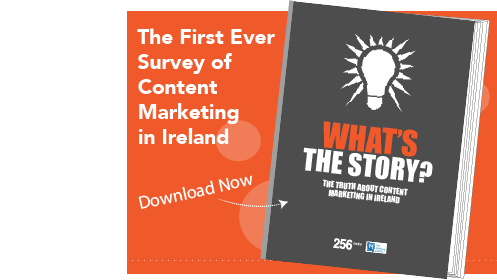 Download Ireland’s first ever Content Marketing Survey report. Click the image below and fill in the form to get your copy!